I can’t get by a day without a snack or two. If you reached into my jacket pocket, you’d surely find an RXBar wrapper. I’m known to have a banana in my purse and a packet of peanut butter with me wherever I go. Why? Because without food, I’m HANGRY and it’s bad. Throughout the years, I’ve learned to be prepared for when hunger strikes. 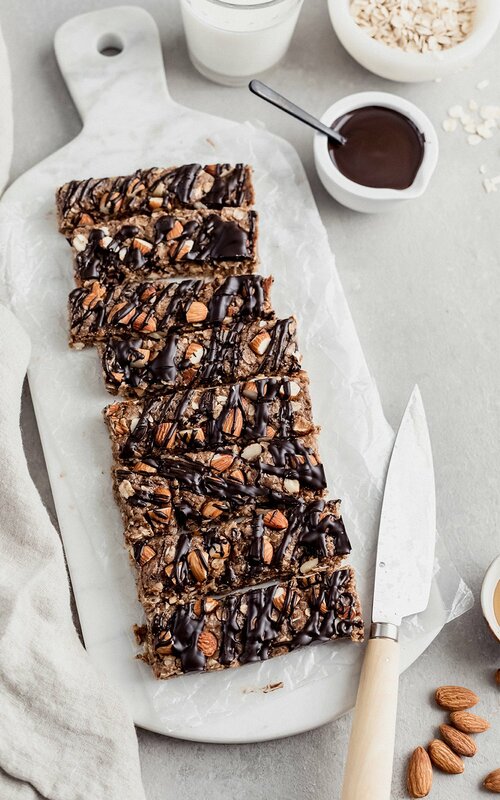 Good news is that I’ve got an incredible nourishing snack recipe for you: I’ve officially made these peanut butter granola bar multiple times since I first developed the recipe. They’re just so good! The best part is that they’re incredibly customizable. You could make a new version every week and never get sick of them. Nut butter: We’re all about the healthy fats here! I like to use an all natural peanut butter (just peanuts + salt). If you wanna switch it up, you could try almond butter, cashew, pecan or even sunflower seed butter for a nut free version (without the addition of almonds of course). Honey: naturally sweetened and just the way I like it. I love using manuka or raw honey because if it’s healing properties, plus I find that it’s a little less sweet than most commercial honey (such as clover). I also recently discovered Soom Foods Silan date syrup that’s only made with dates! YUM. Flaxseed meal: a natural source of protein, fiber and good for you vitamins. I love adding it to granola bars because it adds a nice nuttiness. It’s also great for mamas who might be nursing. Chia seeds: another great source of fiber and protein and helps to keep you feel satisfied as chia actually expands in your stomach. It also helps to keep the bars together. Oats: I love using gluten free old fashioned oats in this recipe. They’re pretty easy to find and are a wonderful complex carb to help provide you with energy. The rest of the recipe is very flexible. Stick to the base but from there you can adapt! You can use any kind of nuts you want instead of almonds, or sub dried fruit such as raisins, dried cranberries or dried cherries. You can also skip the unsweetened coconut (though I think it adds a nice bulk to the recipe and natural sweetness). If you’re trying to reduce your sugar intake, simply skip the melted chocolate on top. SO MANY options and I’m incredibly excited for you to make these bars your own. If you make this recipe, let me know how you liked it by rating the recipe and leaving a comment below. And don’t forget to use the hashtag #ambitiouskitchen on Instagram so I can see your creations! 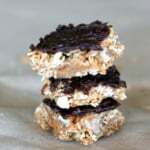 No bake peanut butter granola bars packed with wholesome ingredients like chia seeds, flax, almonds, and dark chocolate. 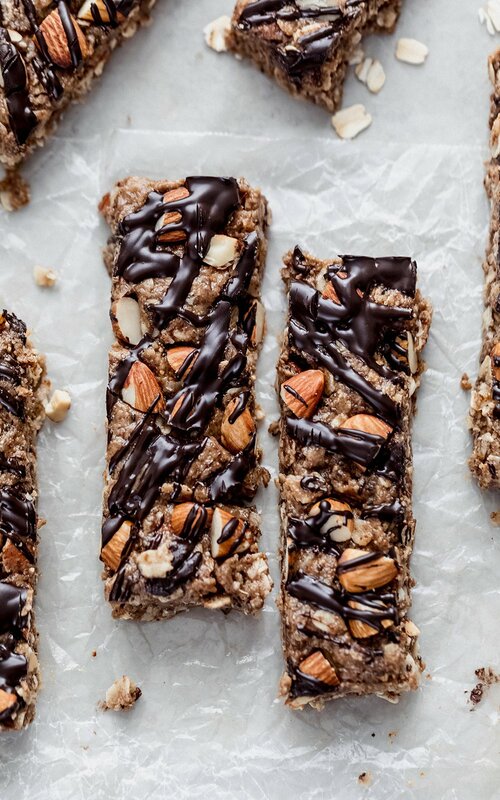 These chewy granola bars will be your new favorite grab-and-go snack! Add peanut butter, coconut oil, honey, vanilla and cinnamon to a medium saucepan and place over low heat. Stir every so often until the mixture is smooth and creamy. Remove from heat and immediately stir in flaxseed meal, chia and oats. Fold in almonds and shredded coconut and stir until combined. Line an 8x4 inch loaf pan with parchment paper; pour granola bar mixture in and spread out evenly, then press down in the pan very firmly. Press remaining roasted almonds on top. Place dark chocolate chips and ½ teaspoon coconut oil in a microwave safe bowl. Microwave on high in 30 second increments, stirring in between until chocolate is completely smooth and melted. Drizzle diagonally over bars. Cover the bars with foil, and place bars in the fridge for 30 minutes-1 hour or until mixture has hardened. 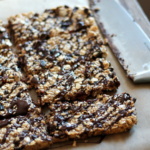 Remove bars from pan and cut into 8 granola bars anyway you'd like. Store bars in the fridge, either individually wrapped in plastic or in foil. Bars will last up to 1 week in the fridge. Stove top method: Place almonds in a small pan over medium heat. Stir until toasted and fragrant, about 3-4 minutes. They are done as soon as they start looking darker and smell toasty. Immediately remove the pecans from the pan to a bowl or paper towel to prevent burning. 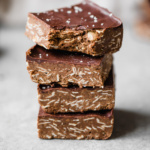 To make bars vegan: Use coconut palm syrup or date syrup instead of honey. 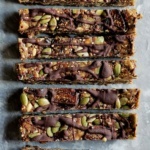 To make bars nut free: Use sunflower seed butter and sunflower seeds in the recipe. Please be aware there is coconut in this recipe if you are sensitive to it. Feel free to double the recipe and place in an 8x8 inch pan. Feel free to use any natural nut butter you’d like. 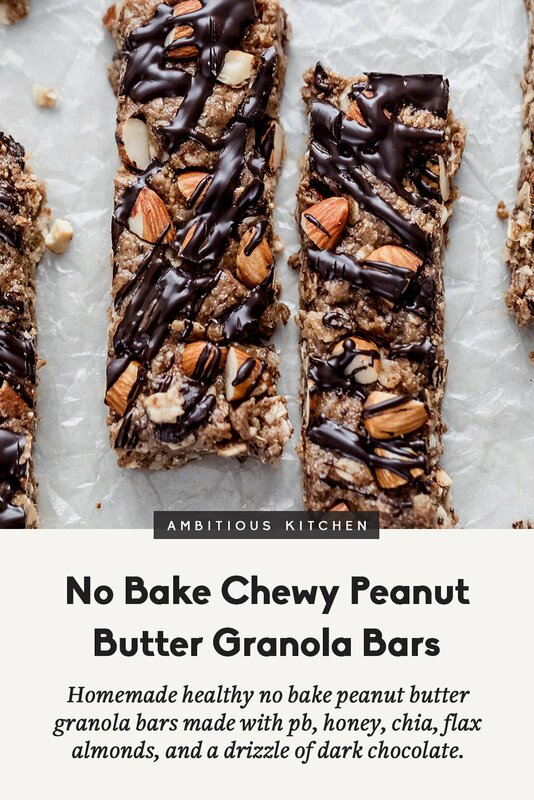 101 Responses to "No Bake, Chewy Peanut Butter Granola Bars"
I’m a physio, and it sounds like it could be a herniated disc. My 2 cents! Hope you get the help you need! Hi! How long do these bars last? Should they be refrigerated? Hi Jennie! Per the recipe instructions, the bars will last 1 week in the fridge! Hope you love them. Saw it, made it, it’s in the fridge and will go with us on a family wedding weekend at Tahoe!!! Thank you!!! YES hope everyone loves them!! Good job taking care of yourself! I hope you feel better soon. That is the worst. But these bars look pretty dang good! I’ve been craving a bar like these this week! Thank you! 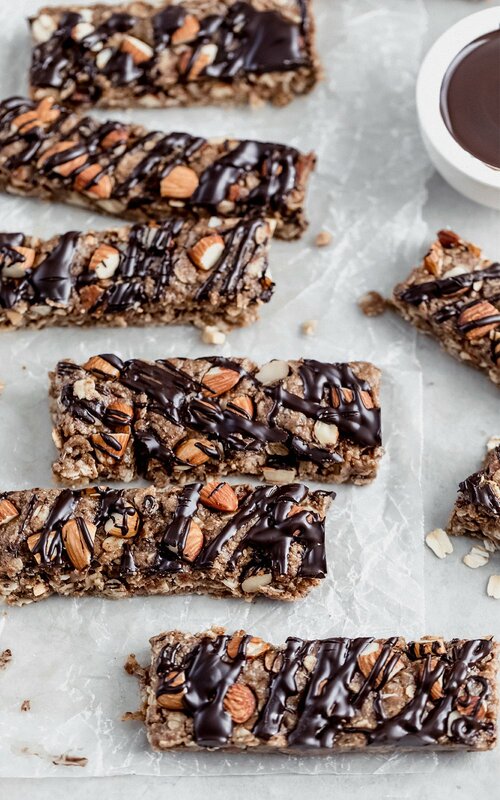 These bars definitely helped out 😉 great go-to snack or treat! YES they’re so delicious! Enjoy! Mine are in the fridge now, can’t wait to try them!!! These look delicious! but I don’t have any flax seed meal :(. Do you think almond flour would work as a substitute? I haven’t tried it so I can’t say for sure, but I would guess it might work. I have everything but the coconut oil. Any recommendations for substitutes? Butter or vegan butter would the only sub that would work well. Is the flaxmeal and chia seeds essential to the recipe? Or can I leave them out? You can leave the chia seeds out but the flaxseed meal helps hold this all together! I made these today and they tasted great! We will probably double the recipe since these went pretty quick. – Question though.. we put these in the fridge but they never really “hardened.” They easily broke apart when we tried to cut them. Do you know why or what we need to do for them to come out more like bars? Allow them to thaw a bit before cutting them. Also make sure you used an all natural creamy PB. Some have higher oil content and some less. I suggest adding another tablespoon of coconut oil if you are having issues next time! I had the same experience as Anjelica. Made the bars using the ingredients in the recipe, but they are very soft and definitely not going to be transportable as an easy snack to eat on the road. Is it possible the peanut butter (sorry I used Kraft smooth as I was out of natural)? It almost seems to oily so perhaps I’d remove the coconut oil from the base if I tried this again. Flavours and carbs are just where I needed them – now to get them hard or at least not flimsy would be a bonus. Hi Susan! Make sure you used an all natural creamy PB. Some have higher oil content and some less. I suggest adding another tablespoon of coconut oil if you are having issues next time. Can I ask what brand of natural creamy PB you use. I made these and they would not harder up as well. Not sure if a table spoon more of the oats would have been helpful? I did leave out the coconut itself ( my kids are not fans) so I am not sure if that is the issue or just the PB. I use Smucker’s or the all-natural 365 brand from Whole Foods! The coconut actually helps bind these together, so leaving it out is probably why they didn’t hold up as well. You could try more oats next time! Unfortunately, when I made them they crumbled apart. No bars, just a crumbled mess. Any suggestions? Still delicious! Hi Trina – allow them to thaw a bit before cutting them. Also make sure you used an all natural creamy PB. Some have higher oil content and some less. I also suggest adding another tablespoon of coconut oil if you are having issues next time. Perfect! Hope you love these ones. Ack! I didn’t notice “roasted” almonds! I was just mesmerized with the picture! They’re in the fridge now hopefully they’ll turn out as great as they sound and look! I didn’t notice the roasted almond part😣 hopefully they come out good. I love these bars. I made them to help me get through my post-Halloween candy craving. They satisfy my sweet tooth cravings and I feel better that I know what’s in them! I’m creating a post about this for my fashion + lifestyle blog, Lunch With A Girlfriend. Will these turn out without the oats in them? Or can you suggest something other then oats? What about extra nuts? 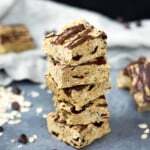 Made these No Bake Peanut Butter Bars today for my husband and myself and they were a hit! So delicious and easy to make! I used pecans only instead of almonds, but that was my choice, but we really enjoyed them!! Thank you! Im thinking to make them as part of Christmas gifts along side some cookies too. Especially becaue these bars are healthy and not full of bad sugar. I bet they are great for a post workout meal right? So if the bars are not hardend enough can I keep them longer in the fridge instead of adding more coconut oil? That sounds fantastic! And yes just keep longer in the fridge until hardened— usually an hour does the trick. Delicious, Monique!!! Everyone went nuts for these, including my picky two year old and my 10 month old! I definitely need to double next time 😀 Instead of chocolate chips on top I melted 1/4 cup coconut oil and mixed it with 1/4 cup raw cacao powder and 2 T pure maple syrup. SO GOOD! Thanks for posting idea of using cocao powder, added pecans instead of almonds….my 3 children devoured them! Thanks Monique for another HIT! Love this recipe! The video makes following the recipe steps so easy. Question unrelated to baking/cooking – what is the song you used for the recipe video? Thinking it would be a great workout track! These bars look so good! My husband is such a granola bar lover and has at least one a day. I definitely need to make him some of these to pack in his lunch! So much better than the packaged version! I actually can’t believe how delicious these are! I used half pecans, half almonds. I used half peanut butter, half tahini. Added the dried fruit I had in the cupboard (currants and raisins). I didn’t add the chocolate because I didn’t have any, and, honestly think they are sweet enough as is! Thank you so much, I cant wait to make again! This most certainly looks like my kind of snack! 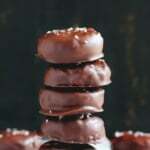 I’ll have to use date syrup or coconut palm syrup for this recipe. 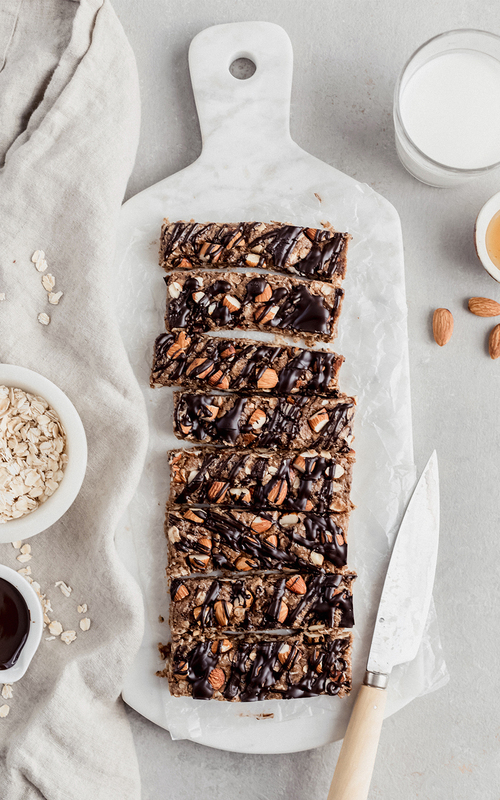 Other than that, these granola bars are perfect–almonds, peanut butter, chia seeds, oats, and coconut, those are all my favorite additions in a granola bar! Delicious!!!! Best peanut butter protein snack EVER! I like to add a tbsp of Maca and some cranberries on top. My favorite snack so far. All I can taste is the damn flaxseed. Waste of ingredients. Glad this was made in a loaf pan and not a brownie pan full. Sorry to hear that, Marie! I’ve never had an issue with these tasting just like flaxseed. I would maybe double check your ingredient ratios to be sure that everything was accurate! These look absolutely delicious – I can’t wait to give them a try! I’m a sucker for peanut butter but I could see this working with almond butter too. And the almonds and chocolate drizzle really give this a special touch, I love it! They’re amazing! Hope you get a chance to try them (and almond butter would be great, too). Delicious and healthy. Good flavor. Will make again. They became great! Very suitable for athletes. What is the best substitute for the flaxseed meal? I don’t need them to be vegan and I don’t normally have that. Unfortunately, I haven’t tried substituting it. I use flaxseed meal because of the high-quality nutrition it provides (healthy fats, fiber, and protein!). I don’t recommend leaving it out! The bars are just yummy! I want to make them again but have ran out of peanut butter. Do you think I can use another tahini, for instance sesami tahini or sunflower seed butter? They are all home made if this makes any difference in this case. Yes almond, cashew, pecan, or sunflower seed butter should work well! These are wonderful! I have made them twice…my husband & several people at work love them! They will definitely be a staple. 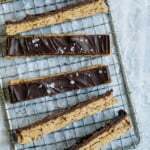 I used toasted almond slices & spread the chocolate over the top, rather than drizzling…otherwise I followed it.Thank you so much for always sharing great recipes!! Best granola bars I’ve ever had! I used almond butter instead of peanut butter and added hemp hearts and pumpkin seeds. I also used 86% dark chocolate instead of normal dark chocolate chips because I’m trying to be really healthy. Seriously amazing though! These did not disappoint! So glad you loved them Heidi! Those swaps sound perfect. Oh, God, absolutely delicious! Sure satisfies a “sweets” craving and it’s all good for ya! Thanks!! They should be kept in the fridge, that’s how they normally stick together best. You can also put them in the fridge to help solidify them. Love these! I just finished making them for the second time. I omit the chocolate drizzle and extra almonds on the top (due to laziness) and just sprinkle a few chocolate chips on instead. Sooooo good! So happy to hear that Kristy!! I’ve made these twice now! I used maple syrup instead of honey. They are so yummy! These were amazing! And, they came out exactly like the picture. They’re a yummy and satisfying little snack when I need it. I’ll certainly make them again, probably for Easter when we have lots of people looking to avoid all the sweets and candy. Thanks for a great recipe! Perfect! Glad you loved them 🙂 Great for sharing. These are amazing! My husband and I both love them. Thank you.